Log visualization that runs in the browser. Bogey is a web-based log visualization framework. 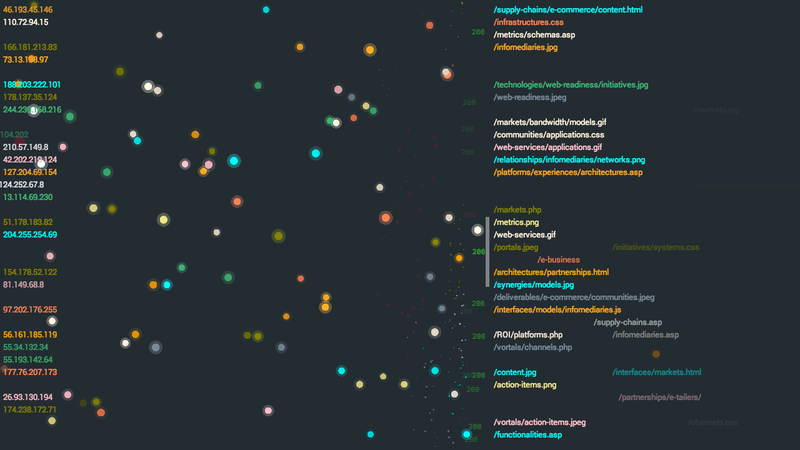 It makes it really easy to create visualizations from your log files. Bogey comes with server that watches your log files and emits data to a simple web framework designed to host pluggable visualization modules. It's totally free and open source. Check out a demo of Bogey Pong, the visualization that ships with Bogey. If you're already using Logstash to centralize your logs, Bogey is even easier to use. Check the documentation for information on how to hook up Bogey to Logstash. Bogey is a module for Node.js. There are installation packages available for most platforms. Start Bogey and give it a log file to watch. Check out the documentation for more examples. Open your browser and point it to http://localhost:8008. Bogey ships with Bogey Pong, a Pong-like visualization for web server access logs heavily inspired by the awesome Logstalgia. Bogey Pong represents web server traffic as a giant game of Pong. Every request is a ball, with successful requests (200 status codes) being returned by the paddle. 400 status codes are misses and 500 status codes are screen-shaking explosions. Requests are grouped together by IP address and floods of requests from the same client are represented as long streams of balls. This makes it really easy to pick out strange or suspicious traffic patterns. Bogey Pong uses the Phaser game engine. It also comes with a bunch of themes based on popular programming color schemes. More visualizations are coming soon. The goal of Bogey is to make it really easy to create great visualizations from your logs. Check out the documentation to get started creating your own. Bogey was created by Cognizo. Bogey is available under the MIT License.